Hey folks, tomorrow is Nerd Christmas, otherwise known as Free Comic book day. Take your loved one down to the local comic book shop. 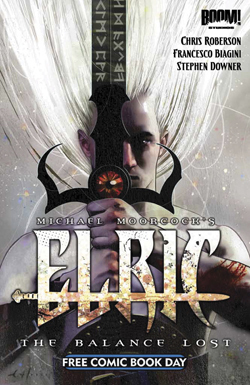 I recommend the free, 10-page prologue to Chris Roberson’s Elric: The Balance Lost. This is an original 12-issue miniseries starting this summer, and based on the characters and worlds of Michael Moorcock. I’ve read it, it’s beautiful, and I can’t wait for the rest of the series. Chris, who is a Moorcock fanatatic, is guaranteed to knock this out of the park. And hey, while you’re there grabbing the free stuff, you can pick up Dracula: Company of Monsters #1 for only a buck. BOOM! Studios is doing a special reissue of Drac and a few other of their books for the day. See, BOOM! is all about the teasing and the tempting.